It would've been one of those rare occasions when a batsman clears the fence to win his side a game of cricket and flash an apologetic look. Colin Ingram wore just that after he dispatched Piyush Chawla over long on to take Delhi Capitals to a seven-wicket win over Kolkata Knight Riders. While coach Ricky Ponting was one of the first to stand up and applaud from the dug-out, Ingram was muttering an apology to his partner, who was stranded on 97 at the other end, robbed of the chance to score his first IPL hundred. It was the second time this season that a Delhi batsman was denied a century, and against the same opposition. When the teams first met at the Feroz Shah Kotla, Prithvi Shaw fell on 99. At the Eden Gardens on Friday (April 12), it was Shikhar Dhawan. The timing, though, of Dhawan's 97, that came off just 63 balls, couldn't have been any better. Dhawan, who was traded to the Capitals from the Sunrisers Hyderabad, had not delivered to his potential. Yet. Unhappy with the 5.2-crore price tag that he carried at SRH - where he was the highest run-getter with 2768 in 91 innings - he opted to return to where he started from, home, but had not had his breakthrough moment so far this season. "Today's innings is a Shikhar Dhawan innings. When he's set he takes the game away," said DC team mentor Sourav Ganguly after the game. "When he plays for India, he bats this way once he gets set. He's a class act, actually. Makes runs consistently in the international format. We were desperate for Shikhar once we heard he wants to leave Hyderabad. And now this is the most important phase of the tournament, so good to see him get a big score." Amidst all the criticism that Dhawan was at the receiving end of, Ganguly had said he wanted his left-hander to play attacking cricket and believed the results would follow. Dhawan, however, took six balls to get off the mark on a good batting track in Kolkata. It seemed like a familiar script, until Prasidh Krishna's second over was taken for 17 runs - all of which came off Dhawan's bat. Two upper cuts for six and a four in an over, before three fours off Andre Russell in the next, and Delhi had raced away to 45 in four overs, chasing 179. KKR were 10-15 short of the par score on the wicket, and with dew setting in, it was the beginning of a much-needed turnaround for Dhawan, as much as for the justification of his role in the side. He was in his element, with runs coming from all over but primarily dominating the offside. His drives were elegantly fluent, flicks, nimble, and his cuts boasted of supremacy. All of which added to confidence that he seemed to be lacking so far. He eventually shared a match-winning 105-run stand with Rishabh Pant, who fell for 46 (off 31) just as Delhi were on the brink of a win. At SRH, Dhawan, together with David Warner, formed a formidable opening partnership that worked wonders for them. While Warner teed off from the onset with incredible consistency, it gave Dhawan the allowance to settle in. But on the occasion that Warner fell early, Dhawan had to hold fort and construct the innings with a rather fragile middle order, summating his average strike-rate between the 120s and 130s since 2013 while with the franchise. In DC though, he has a different role. Dhawan is the beacon of wisdom and experience among a top order that boasts of youngsters who are big hitters and match winners in their own right. 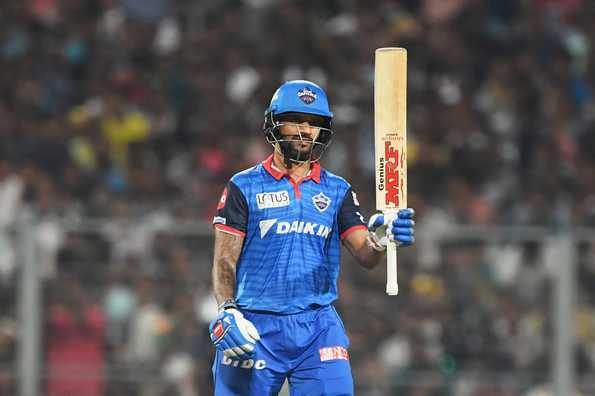 Dhawan providing stability at the top, albeit in an unflappable innings of no imprudence, lends the likes of Shaw, Shreyas Iyer and Pant the freedom to play their natural attacking game, while the 33-year-old holds fort at the other end. "That is what we want from Shikhar [Dhawan]. Hold the top order together," Ponting had said after DC's opening game against Mumbai Indians where Dhawan had notched up a composed 43 off 36 balls. It wasn't an easy pitch to bat on with a bit of seam movement in it early on. After losing Shaw and Iyer early to Mitchell McClenaghan, Delhi needed Dhawan to see through the tough overs and keep Delhi in the game, given their potential to have a meltdown as seen a few games later against Kings XI Punjab where they lost 7 for 8. Dhawan's stability at the other end against Mumbai gave Colin Ingram and Pant the leeway to attack at one end as he held the innings at the other. Ingram fell for a 32-ball 47, but Pant destroyed Mumbai en route a spectacular 27-ball 78 as Delhi went on to amass 213 in their 20 overs. As he did then, delivering in accordance to the role assigned, he did so against KKR too. The only difference being, the manner in which he did. His innings in Kolkata had the command that the other ones so far lacked. Dhawan went from 1 in 6 to 31 in 17 in no time and there was no looking back thereafter. His knock in the City of Joy would've not just had the Delhi management breathe a sigh of relief right at the halfway stage of the tournament, but India's as well, with the World Cup now just about a month and a half away. If Delhi are to finally break the duck of an IPL trophy, it is this year, with the franchise desperate to turn things around. They made their intent clear when they roped in both Ganguly and Ponting, who were captains of teams that won across the world. With the two joining forces, the surge of determination to overhaul fortunes is apparent. Things are falling in place, one brick at a time, for the Delhi-based franchise.